Hokkaido squirrels look adorable when they are stuffing their mouths with nuts. They live in holes in trees or bowl-shaped nests made of branches. 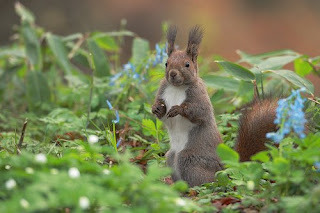 They do not hibernate in winter and eat acorns and walnuts stored in autumn. They are active at dawn and cannot be seen often during the daytime.